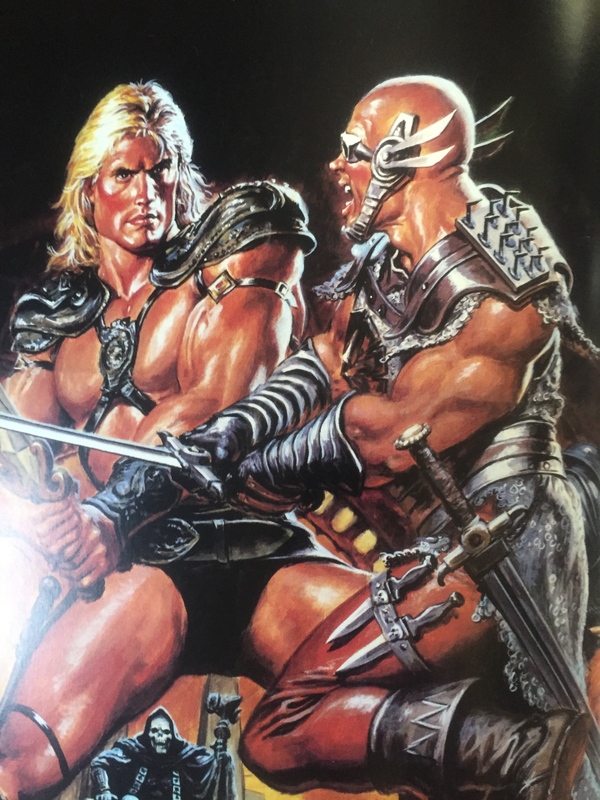 Norem leaves a legacy of Masters of the Universe work, not only including magazines, but all kinds of books. Think “Little Golden Books” type. Also the paperback kind you could get at Book Fairs in elementary school. I reconnected with Norem’s work back in the late 1990’s, when I was just learning to explore the internet. I was a part of Adam Tyner’s page, which eventually evolved into He-Man.org. (I am only a member of the forums there now. Oh. And one of my songs was published on the Roast Gooble Dinner soundtrack.) Back then, I scoured the internet for images of He-Man, and kept a folder on my computer so I could look at them anytime and reminisce. This folder would follow me to today, where I have it on my mac to circulate desktop pictures. Norem’s work is the most classically spectacular of all of Masters of the Universe paintings. Eventually, I would listen to Roast Gooble Dinner, and Val Staples, Emiliano Santalucia, Eamon O’Donahue, and Pixel Dan Eardly would interview Norem. I listened to this interview at least three times! Just to hear him talk about his work…and the guy was almost completely clueless that he was revered as a great artist! To hear his story, he was a painter for advertisements. It was cheaper for magazines to print artistic work than photographs. Eventually he landed the gig to do some Marvel comics, and then pick up with Conan the Barbarian, eventually leading to He-Man. He worked in paints. I recently visited Bob Jones’ University’s Classical Art Gallery, and I dare say Earl Norem’s painting is on par with the great classical masters. A person might argue that his subject matter didn’t lend to the best examples of classical art, with exaggerated muscles or femininity. But he always made He-Man, Skeletor, Teela, Gwildor, or whoever look tasteful. His work emphasised action…his painting always give a sense of energy. I came up with the idea to try and emulate some of Earl Norem’s paintings with the incredibly posable Masters of the Universe Classics figures. I will be featuring some of my results here on SpartanNerd.com in the future. Until then, please go by Earl Norem’s fan page. (You can see some of his art. I believe Eamon O’Donahue runs this site.) Also swing by He-Man.org. This entry was posted in Masters of the Universe, SpartaNerd and tagged art book, Earl Norem, Masters of the Universe, SpartanNerd. Bookmark the permalink.